Live-In Care | Full Circle Home Care Inc.
It’s reassuring to know that our live in caregivers can make it possible for your aging parents to live as independently as possible in their own home. 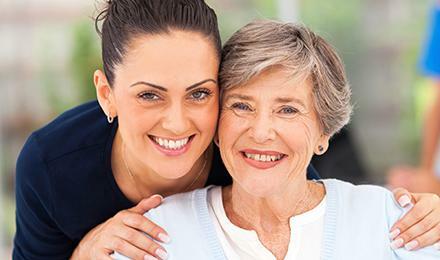 Whether your parent needs personal or memory care services, basic housekeeping or companionship or around the clock care, Full Circle Home Care will create a customized care plan for your loved one’s unique needs. We also recognize that your parents’ needs evolve over time, and we are here to reevaluate their needs every step of the way to maximize their freedom and quality of life. If your elder needs considerable help on a “live-in” basis, Full Circle Home Care can provide a live in care provider to assist with all activities of daily living—cooking, light housekeeping, grocery shopping, errands, bathing, dressing, grooming and transportation. Our live in caregivers for seniors can reduce fall risk, offer emotional support and provide supervision. Live in caregivers spend the night in the elder’s home. They do sleep on the overnight shift, but are there to help the client at all hours. Some older adults need continuous care to remain in the comfort of their own homes. People requiring 24/7 attentive care may wake often, wander, suffer from dementia or have a chronic medical condition requiring continuous monitoring. For these seniors, Full Circle Home Care can provide two or three live in caregivers who work 8- or 12-hour shifts to ensure an elder’s needs are met at all times.